Another beautiful day here in this magical Union Glacier community camp. -18C in such sunny weather is much more pleasant than a typical winter’s wet and windy day at home in the lakes. We’re looking pretty close to our 200kg each target weight and it looks like it’s all going to fit in our big sledges or pulks. Approximately 100kgs of kit & 100kgs of food & fuel has to be packed into the Canadian canoe sized beasts that will be our greatest ally, but our most woeful foe for the next 10 weeks. 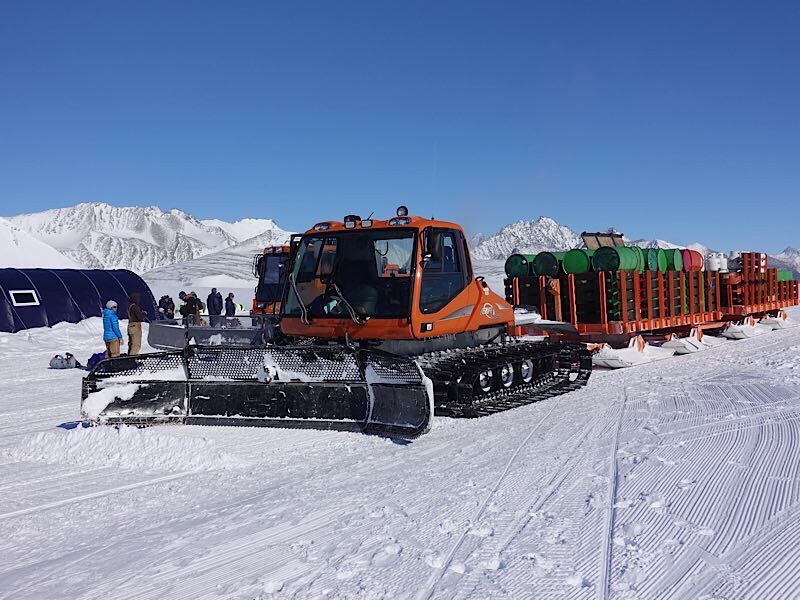 They contain a meticulously considered selection of equipment that will not only enable us to survive but also to thrive in this harshest, yet most magnificent environment. We have the means to live in relative comfort out there and the tools to attempt some seriously adventurous tasks. It has taken a long time to assemble this 200kgs of the lightest, strongest kit ever made and we now have to move it for close to 2000km. That is going to be a pig and we are going to be cursing them the whole way. After more sorting of food we checked in with the various ALE departments: medical, travel safety, communications and operations. Then travel safety. ALE have some epic GSI mapping software that overlay all kinds of different maps, satellite images, ground penetrating radar and other data in one place. They already have our proposed route and we made some tweaks and adjustments to it based on the newly available terrain information. Mainly to avoid crevasse fields. Then communications. It’s an incredible operation keeping track of all the people, aircraft, camps, equipment and weather out here mainly via satellite comms. Each remote field party has a daily specified call in time. It is crucial to hit the 10 minute call in slot to let them know your position, situation, status and plans. If you miss one call in they will be on alert and initiate all attempts to establish contact. If you miss two they automatically launch a rescue that takes precedence over all other operations. Therefore it is obviously very important to check in on time. 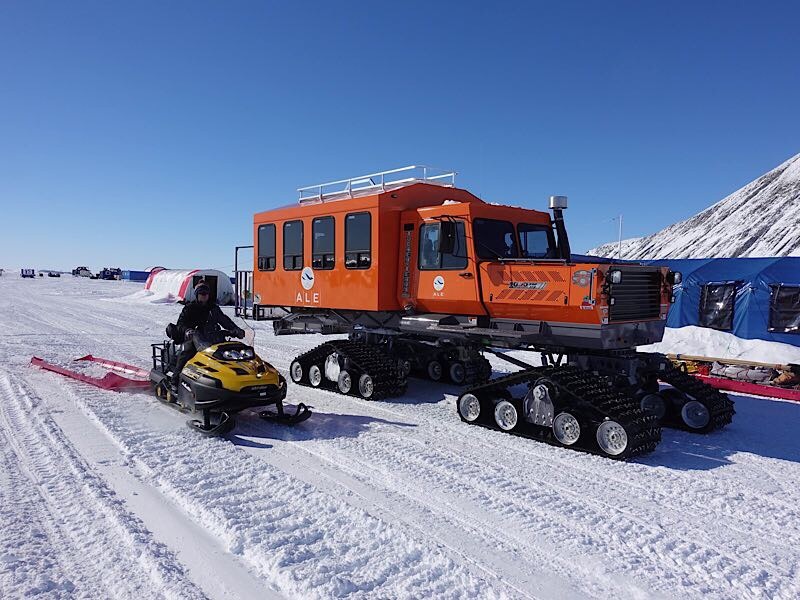 Meteorology are also based in the comms tent constantly analysing weather models for all over Antarctica to asses flight capabilities and schedules. Finally operations who do an amazing job of spinning all the plates without dropping any and getting everybody where they need to be as safely and efficiently as possible. Though the poor Ice maidens are still stuck here after two weeks after once again being delayed by cloud cover preventing landing at one of the their 3 landing sites on their journey to the Ross ice shelf at the foot of the Leverett glacier; actually not very far from the Spectre. We are staring our journey much further south and only have 2 landing sites. It therefore looks like we might be out of here tomorrow although we do still have at least a few more hours of prep. It would be nice to have one more day to finalise but if we do have a weather window it would be madness not to grab it. Excitement is starting to take hold but anticipation is right by its side. What will it be like up there? Cold I dare say! But we have what we need and if things go well we could be 300kms further north and 1500m lower altitude in just a few days where it should be much warmer. At least that is our hope! What are those grey bags made of? The grey bags are from SeatoSummit and are made of a waterproof nylon with an eVent® fabric base. When the pulks are bumping over the rough snow and ice surface, kiting at speeds of up to 40km/h there is quite a risk of internal food bags bursting or abrasion of sharp objects against soft fabric. Bagging stuff minimises the damage and losses if this occurs. 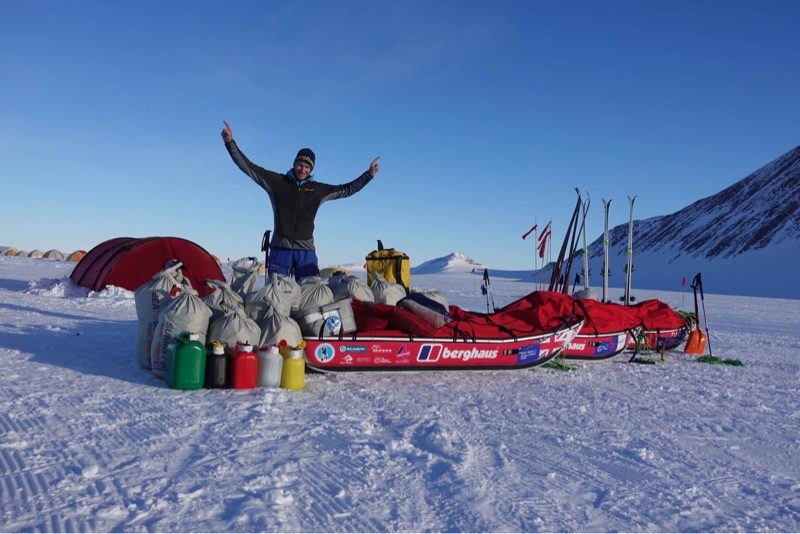 Jordan Blake on SPECTRE EXPEDITION IS GO! Heather, Geoff, Alena and Abigail on Spectre Expedition, signing off!